It was the first "Unofficial" holiday weekend of the summer. And, it was a busy one! We took our weekly Saturday Night pizza-and-movie down to the trailer. 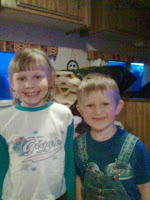 Rebekah and Michael thought that was awesome!! Nothing like snuggling up in a little trailer, watching Cinderella on a tiny t.v., eating personal-sized pizzas that were cooked on the BBQ! We had a great time, and were woken up the next morning by rain hitting the roof of the trailer. We had a lazy breakfast, then headed up to the house. Sunday we headed down to mom's for a family day. We all had a blast. I don't have any pictures, but Sarah does. From the stack of planks to the corner, and all the way out to the bags of topsoil. 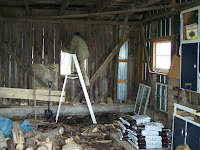 There are two windows in this corner, and it seemed silly to light up the woodpile, while Jeff's workbench was in the dark! 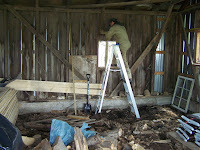 One of the windows had been taken out, so Jeff had to alter the hole to accommodate the larger window that we had. We had to clean up 9 years worth of bark on the floor, but it sure is looking great! I would post a picture of our neat woodpile, but for some reason Blogger won't let me. :( I'll update with the finished product! I can't wait to see the finished project! Good for you, and good for Jeff! YEAH!